Sporty or family canyon. Just make your choice in Chamonix’s fun canyon. It is a very secured canyon with plenty of alternatives. The whole thing makes it a real sporty experience. On a family trip, we choose the parts that suit the children so everyone has fun. Sporty canyon : We’ll reach the most spectacular obastacles (jums, zipline, slides) for those seeking real action. All obstacles can be bypassed, anyways. Family canyon : Depending on participant’s age and capacities, we’ll adapt jumping and abseiling heights. All obstacles can be bypassed. 100 % fun for everyone, minimum recommended age : 8 yo. Price : 62 € / pers. Sporty canyon. A sporty canyon that offers all what canyoning is about : jumps, abseils, slides… Such a great escape ! Among the green mountain pastures, we bump into an impressive gorge. First, it’s a very aquatic first part with some jumps (6m. Not compulsory) and slides that bring you up right into action. Then, the series of high waterfall abseils makes a spectacular end. This canyon reacts to rain. It offers several escapes or bypassing tracks. A very varied and super fun canyon. A great experience you want to share with your friends or family. The first half is a succession of nice falls on which we take some time to learn the abseilling techniques. The gorge opens up, then into a dense and lush forest. Then comes the wicked finish : tens of natural slides. A genuine aquatic park. The water level can vary depending on the rain. In case of heavy rain, one can easily walk around the big falls or escape the canyon. Location : It’s here ! get 15 % off for 2 outings !! 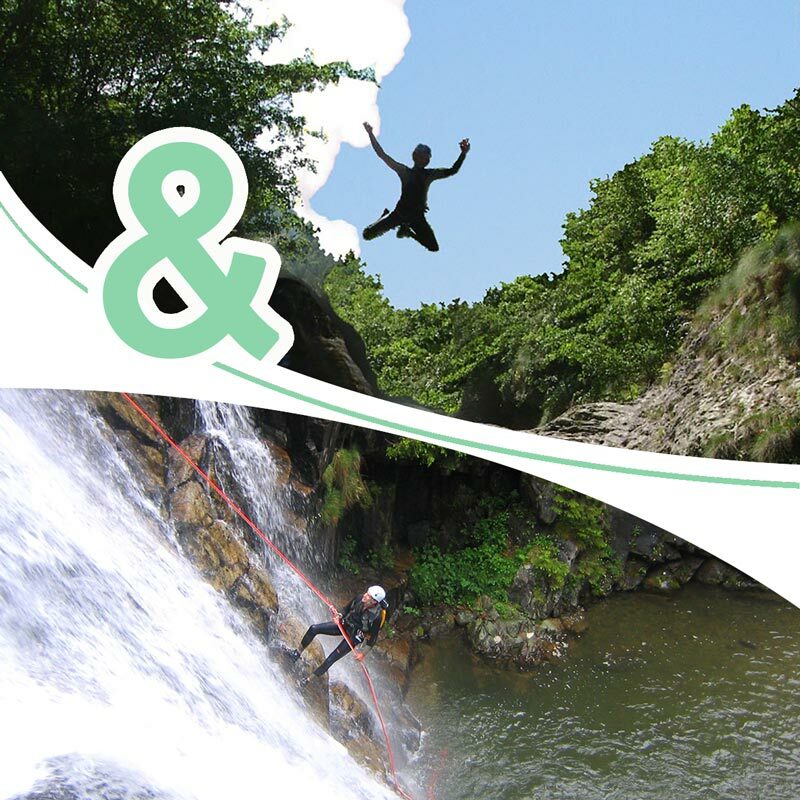 Pick up two of the above canyoning experiences and enjoy a great deal ! Organise your outings on 2 separate days or chose the real sporty option with a full action day. An opportunity to learn the abseiling techniques and gain autonomy with your instructor, discovering 2 very different canyons. Evolution pack : -15 % on total price of 2 outings (124 €). Price : 105 € / PERS.